Art Exhibition – ACSO Branching Out 2014 – Art creating another chance! My own art therapy journey has given me a personal insight as to how art for therapy can help improve a person’s physical and mental well-being. My journey has brought me to understand, that art is an important way for people to be able to express thoughts, emotions, grief, despair, joy and just what’s on their mind! It is important to understand that art for therapy can be experienced by anyone – you don’t have to be an artist to gain a benefit from engaging in art, whether it be as a producer of art or even as a viewer of art instead – gains can be made. Art for therapy gives a voice to people where words can be hard to find, and helps others as viewers to understand, the maker of the art better. Art can help us gain an insight into our own or others – inner most personal thoughts; it came be a window into the sole of the artist. 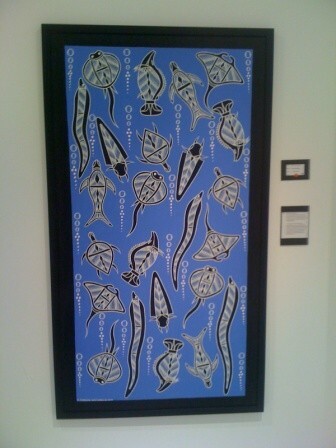 So it was no surprise to my husband when I suggested that we go to ACSO’s Art Exhibition called “Branching Out” 2014 at the Yarra Gallery, in at Federation Square, Melbourne – Australia. The exhibition consisted of self portraits, prints and other medians which have been produced by ACSO clients – via ACSO’s Creative Art Program. I wanted to see what these artists, artists whom are serving time in prison or artists whom had served time in prison had shared in their art. ACSO was established in 1983 and their goal is to reduce re-offending and help people in their transition from prison, assist them in the community, stop them re-offending and divert others from committing crime (ACSO. 2014). Melinda Wills, artist in residence at ACSO provides art therapy sessions to their clients “to find a new form of self-expression, tapping into their emotions and uplifting their spirit through colour, line and texture” thus helping them to express their inner thoughts (Wills. 2014). 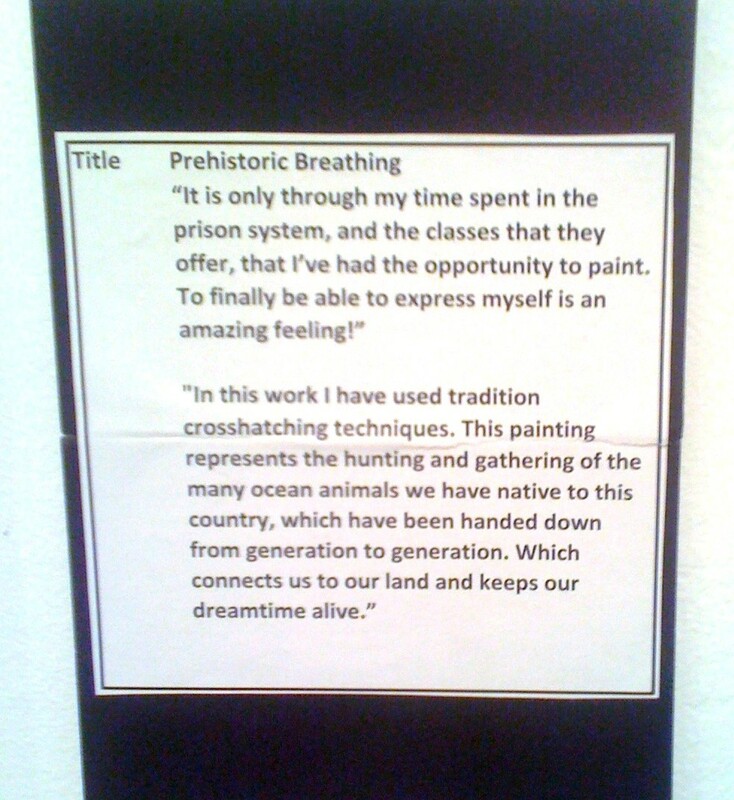 During the exhibition I had the opportunity to speak with one of ASCO’s clients – Michael Morgan about his particular piece of art work called ‘Prehistoric Breathing’ which he had produced through the Fulham Correctional Centre – Cultural Arts Program. Kangan Institute delivers a nationally recognised qualification in Aboriginal and Torres Strait Islander Cultural Arts to Indigenous inmates at Fulham Correctional Centre. The course covers a range of drawing techniques, developing painting and printmaking skills. Concurrently, the Correctional Centre provides Indigenous inmates the Koori Art program as an opportunity to practice their culture. NB: Paintings from both programs were on display at the ACSO Branching Out 2014 Art Exhibition. (ACSO Program 2014). This entry was posted in ACSO Branching Out 2014 Art Exhibition, Art as Therapy, Art Exhibitions of other Artists, My art and tagged Abstract Artist, Abstrast Art, ACSO Branching Out 2014, Art Therapy, Cultural Arts, Indigenous Inmates Koori Art Program, Inmates Art Exhibition, Karen Robinson, Koori Art Program, mental health, Well-being by idoartkarenrobinson. Bookmark the permalink.